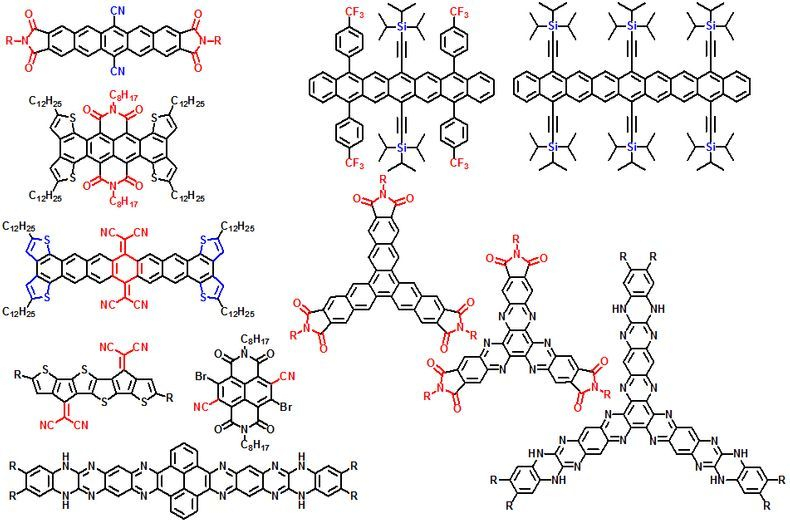 The structural design and synthesis of the monodisperse pi-conjugated oligomers, dendrimers and novel polymers will be focused. Oligomers can serve as the model compounds for understanding the relationship of structure and properties of their corresponding polymers. Moreover, they can also be used as defect-free materials for organic devices. New homopolymers and copolymers with (including the electronic, electrochemical, thermal and photophysical properties) and their applications in organic electronics such as field effect transistors (FETs), solar cells and light-emitting diodes (LEDs). Some examples are shown below. Ionic π-conjugated polymers have attracted interests due to their interesting self-assembly properties and wide applications in chemosensors/biosenors and multi-layer LEDs. Our research goal is to design new polymeric structures with high luminescence quantum yields and to develop sensors with high selectivity and sensitivity on DNA, proteins and various ions.